Welcome to the spring 2018 Sanford Inspire newsletter, where you’ll find updates on all the latest and greatest Sanford Inspire happenings. Be on the lookout for future newsletters too, as we’ll continue to share updates and exciting news regularly. Here’s what’s going on now! We are proud to announce the launch of our new and improved module platform. You will find access to an improved user experience with express modules, enhanced content, an expanded library, and easy navigation and search tools. Be sure to watch our videos on how to access the on demand modules. An improved learning experience from the leader in teacher professional development We’ve redesigned the entire user experience to make it faster for you to find modules, earn certificates, and keep track of your progress. New express modules: Complete in 30 mins. or less To improve the user experience, we have redesigned some standard 60-minute modules into express 30-minute modules to provide additional ﬂexibility. Improved module ﬂow Improved navigation tools allow you to easily traverse a module while allowing you to always know exactly where you are. Fully-responsive for all devices Complete a module at home or on the go, wherever you have access to a desktop, tablet, or smartphone. Sharing Modules: What better way to share modules with your coworkers and friends then by a click of a button? The Sanford Inspire modules can be shared that easily. When accessing a select module, you are able to share it with others through Facebook, email, and Twitter. 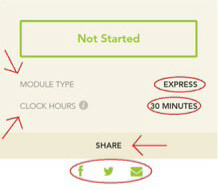 All you have to do is click the “share” button located below the box used to start the module. It will then give you three clickable icons to share using the platform you select. Clock Hours: An essential attraction of the Sanford Inspire modules is the professional development experience. Each completed on-demand module generates a professional development certificate; either 60 minutes for a standard on-demand module or 30 minutes for an express on-demand module. Please join us for the Sanford Inspire webinar series showcasing best practices for integrating Sanford Inspire. You will have the opportunity to hear representatives from National University’s Sanford College of Education and other educators share their insights and expertise on the integration of Inspire in Pre-K-12 schools, teacher-prep programs, and school districts. Outreach & Implementation of Sanford Inspire at the In-Service Level. District Implementation of Sanford Inspire: Case study featuring Long Island University’s use of Sanford Inspire for professional development days in New York City. Sanford Inspire Integration into Pre-K-12 Schools as Professional Development Tool: Case Study Showcasing Torrey Pines High School Integration Successes. Sanford Inspire Integration Model for Teacher Agencies: Showcase Integration Options for Teacher Agencies that Provide Teachers and Substitute Teachers to School Districts. Panelists at the March 12-13 Sanford Inspire Leadership Summit (left to right): Dr. Joseph Johnson, dean of the College of Education at San Diego State University; Eduardo Solorzano of the Los Angeles Unified School District; Dr. Judy Mantle, dean of the Sanford College of Education at National University; Eric Gurna, LA’s BEST; and Richie Ressel, director of Sanford Harmony at National University. A shared commitment to inspiring teaching and leadership brought together more than 50 education leaders from around the country to participate in the Sanford Inspire Leadership Summit on March 12-13 in San Diego. 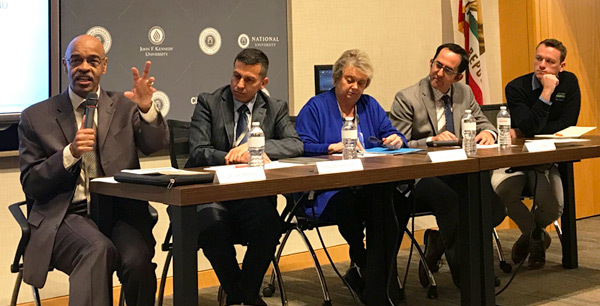 The goal of the two-day forum at the Sanford Education Center at National University was to advance initiatives designed to inspire Pre-K-12 students to succeed. A leadership panel launched the event with a lively discussion featuring panelists Dr. Judy Mantle, dean of the Sanford College of Education at National University; Dr. Joe Johnson, dean of the College of Education at San Diego State University; Eduardo Solorzano, director of instruction at Los Angeles Unified School District; Eric Gurna, president and CEO of LA’s BEST, an organization that provides safe and supervised after school education, enrichment, and recreation programs; and Richard Ressel, director of Sanford Inspire at National University System. The focus of the Sanford Inspire Leadership Summit was mostly on Sanford Inspire, though the two programs are aligned and support the development of the whole child. Sanford Inspire is based on the idea that every child should have not just one, but many inspiring teachers. The program is the vision of philanthropist T. Denny Sanford, who joined the Leadership Summit to chat and mingle with the educators. When asked what defines an inspiring teacher, the panelists responded that a teacher’s highest priority is to establish positive connections with students through relationship building and caring. When educators create an environment where students feel valued, respected, and capable, it leads to a positive, transformational culture where teachers can build effective, engaging instruction that is essential to student success. During the Summit, Collaborative members shared how they are integrating Sanford Inspire principles into their schools of education or through professional development outreach. Examples were shared by: National University and City University of Seattle – both part of the National University System; Long Island University and Nova Southeastern University. Adding perspectives, the Leadership Summit featured a presentation by David Quilleon, sr. vice president, Global Mission, State Development and Operation of Best Buddies. Following a celebratory evening recognizing Sanford Inspire champions, the Leadership Summit concluded with small group breakout sessions for participants to share their perspectives on inspiring teaching. The Leadership Summit was organized by the Sanford Programs team at the National University System, which is led by Director Scott Page. Sanford Inspire Exchange collaboration with the New York Department of Education, Broward County Public Schools, Long Island University, and Nova Southeastern University. Long Island University and Nova Southeastern University held the first ever Sanford Inspire Exchange on December 7-8 at the NSU campus. 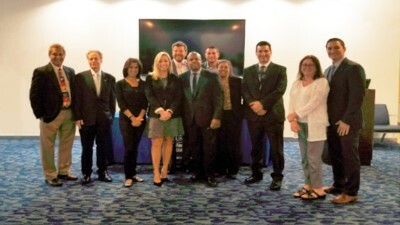 This collaboration included the New York City Department of Education, LIU, NSU, and Broward County Public Schools. The purpose of this event was to bring administrators and educators together to collaborate on school success. The NYCDOE was able to visit three schools in Broward County and learn about the accomplishments and challenges that each are seeing at their schools. The schools have adopted both Inspire and Harmony as part of their daily culture. Modules are used not only for professional development for the faculty and staff, but also to change the way they teach in order to create inspirational classrooms. Thank you to LIU and NSU for putting together an amazing event that allows for collaboration with key participants and is expanding the Sanford Inspire Mission. The Sanford Inspire Collaborative includes public research universities and private nonproft universities with a demonstrated track record of commitment to quality through their teacher education programs. They represent a diverse range of institutions and communities, and are all nonproft universities united in their singular commitment to empowering teachers through quality programs supporting the success of future generations of students. The Collaborative does this through a coordinated effort with Pre-K-12 schools, districts, and teachers that includes professional training and curriculum support that are provided at no cost. Each child deserves an inspirational teacher. The mission of Sanford Inspire is to empower educators with research-based knowledge, tools, and practices so they can inspire students to achieve academically and socially. We partner with teacher preparation organizations and Pre-K-12 school districts to strengthen our vision of providing an inspirational teacher in every classroom.